This new stamp set is truly awesome. It is so very easy to use and covers three months of upcoming holidays. PLUS it comes in a bundle... that means money savings! Who Hoo! I masked the sky and sponged in the moon, then I masked in the moon and sponged in the night sky. I then ran the paper through the embossing folder, and then sponged over the raised embossing marks with a sponge. Stamped the birds and spook eyes. I glued this to pumpkin pie card base. Stamped the inside and the envelope and I am one done....... with a few more to make for the grand kids Halloween treat (money) in the mail! 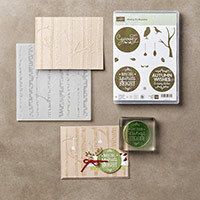 You can get this set and embossing folder too by clicking on the highlighted stamp below. I will show you a couple more cards that we made at Stamp Club using this same great set.